As a garden plant Oleander is without doubt versatile. It is evergreen, grows in warm climates as well as cool and is really easy care. Summer flowering and coming in a range of colours from white through to reds and apricots as well, it also makes a good screening plant due to its dense growth habit. With this we are looking at the dwarf cultivars and the different coloured flowers. The dwarf varieties will reach around 1 – 2m in height depending on climate and conditions, great for a low hedge. Cultivars such as Nerium oleander ‘Cherry Surprise’, Nerium oleander ‘Delphine’ and Nerium oleander ‘Splendens’ are all drought tolerant once established. Dwarf forms are available and Oleander flowers vary from white through to pink and red depending on cultivar. Nerium Oleander Madoni Grandiflorum, also known as Nerium Oleander ‘Madonna Grandiflora’ which is a double white flowering variety and Nerium Oleander Professor Martin are popular cultivars. As for pruning, Oleanders are dense growing, but they are not really woody plants so they are easy to prune. The best time to prune is after flowering but try not to make it to lat e especially in colder areas. As with all pruning you will be pruning to remove dead and damaged wood first, and then pruning to size and shape. 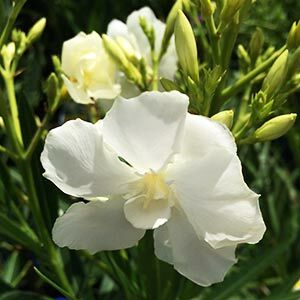 If you are dealing with an older overgrown plant then take it 1/3 at a time if you are worried, although Oleanders are a tough plant. You can usually hard prune them back to .5m and they will still come back, however that is a little drastic for most gardeners. Are Nerium oleander Poisonous ? We of course know that Oleander also gets a bad wrap, because it is poisonous, however so are many other garden plants if you eat them, however as Oleander tastes so awful it is unlikely that it would be palatable enough to be eaten. However we would still recommend wearing gloves when pruning to prevent irritation. Oleander Plants are available for sale from the following wholesale growers.